It can be pretty useful, but more times than not, it can be completely useless. - Grab another employee to ask them where to find it and so on and so on. - Say they don't carry it, when I know they do, I've seen it before, and it's on the front page of the flyer, smiling back at me. - Shrug their shoulders and direct me to another department. The customer is always right' doesn't seem to amount to hill of beans much these days. About four weeks ago, my husband ordered a gazebo for our patio. (Not those wooden ones that you see couples get their photo taken in on their wedding day, but those aluminum jobbers that have to be screwed into the foundation). We did our due diligence by calling up the home improvement store that had them advertised for sale in the flyer to check on the status. Turns out they didn't have them in their possession as of yet, but were waiting for five to arrive sometime that week, ten days at the very latest. We were informed that we could reserve one over the phone to avoid any disappointment and lock into the sale price as well. No brainer. We were also told that someone would call when they arrived and we could pick up at our convenience. Perfect. Of course, life happens, so it wasn't at the forefront of our minds. Plus the weather had been really crummy and cold and hanging out on the patio was the last thing we wanted to do. A few days ago, I mentioned to my husband that we still haven't received word about the gazebo. So I called to find out what's going on. To make a long story short, it turns out that they sold four of them and weren't sure if there was any more in stock. Wait a minute. So a gazebo we paid for, IN FULL four weeks ago had arrived, been marked as 'in stock', and then SOLD, but no one bothered to call us to say they were in? I was raging. After being passed around to several different associates, explaining the story every time I did, I finally discovered that 5 were, in fact, shipped to the store a few weeks prior. THEN I was told it was MY responsibility to call and check on the status. MY responsibility? MY RESPONSIBILITY? As in MINE? Yeah, you can only imagine how wonderfully that went over with me. The associate I was speaking with then told me he would go get a visual on the box and call me back. Okay, son. I'll just hold my breath while I wait. Trying to keep my cool, and THINKING they clearly knew how infuriated I was, I waited. I called the next morning, spoke to the manager, and explained the situation. She quickly rectified the problem and personally went back to check while she kept me on the line. It turns out there were two there, one of which was flagged as paid stock for another customer and one to be sold straight up. Nice. Needless to say, the situation ended up playing out in our favour. The squeaky wheel was oiled and I was happy. I just chalked it up to one of those frustrating and unnecessary life moments. I'm sure there's a lesson in there somewhere to be learned, but right now, I just don't see it. But what I do see are these delicious peanut butter & jelly pretzel bars - in my belly. Every last one. Now, who wants to come over and help put this bloody gazebo together? Preheat oven to 350º. Line a 9-inch square baking dish with parchment paper. 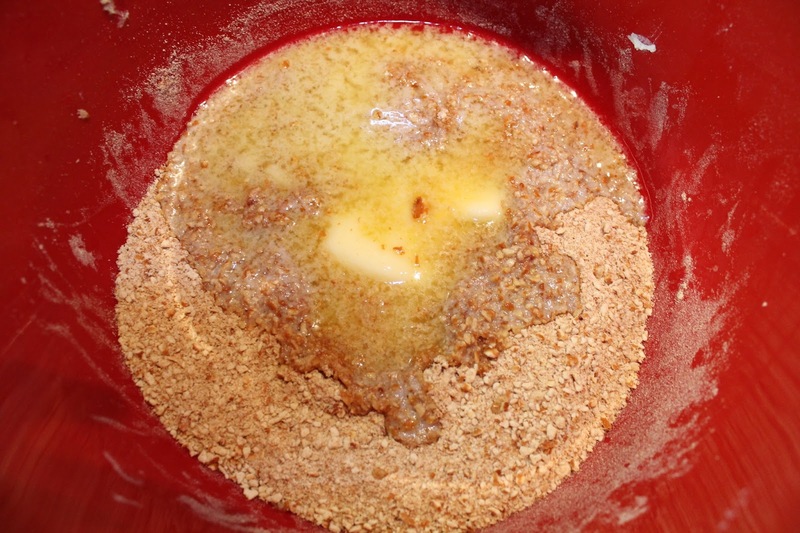 In a small mixing bowl, mix together pretzels, melted butter, and sugar. Press into the bottom of prepared pan. 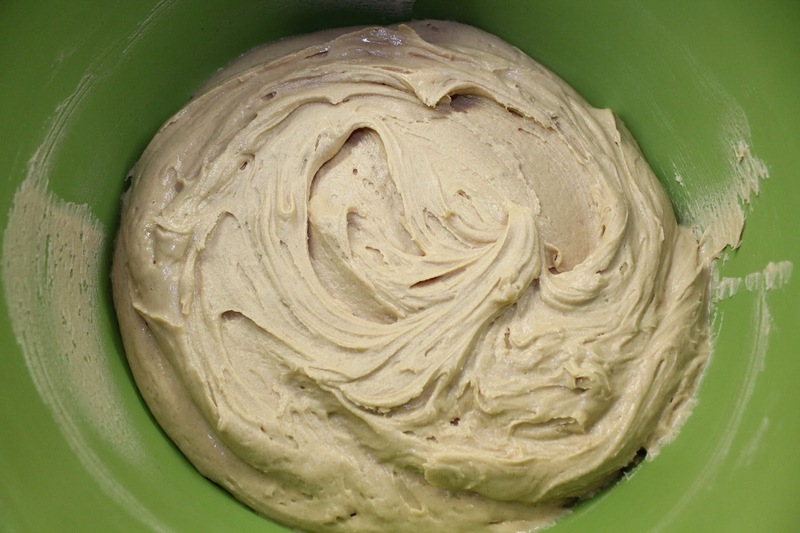 In a separate mixing bowl, beat together butter and peanut butter. Add in icing sugar, slowly, as well as vanilla extract and beat until incorporated. It'll have a fluffy consistency, almost like frosting. Spread over pretzel base and place in fridge for about an hour. 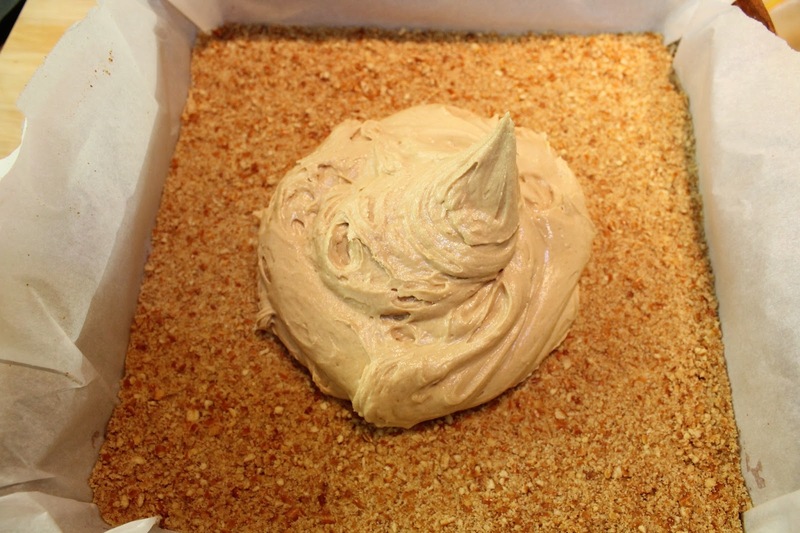 Make crumble topping while peanut butter is chilling. 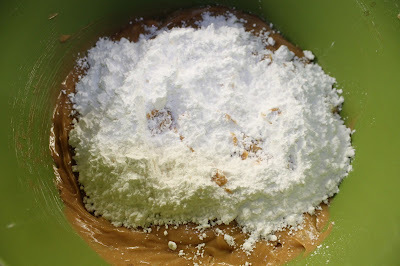 In a small bowl, whisk together flour, brown sugar, pretzels, and cold butter. Using a pastry blender or 2 knives, cut butter into mixture until it resembles coarse crumbs. Once peanut butter is chilled, using an offset spatula, spread jelly/jam over top. I find it easier to microwave the jam so it spreads nicely over the top. 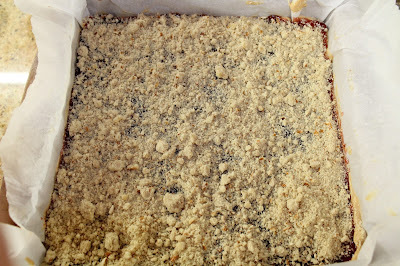 Generously sprinkle crumble over top of jelly/jam. Bake for 15-20 minutes or until crumble starts to get a golden colour. Remove from oven and place on wire rack and allow to cool completely. Once it's cooled, place dish in the refrigerator for about an hour. This step is very important. 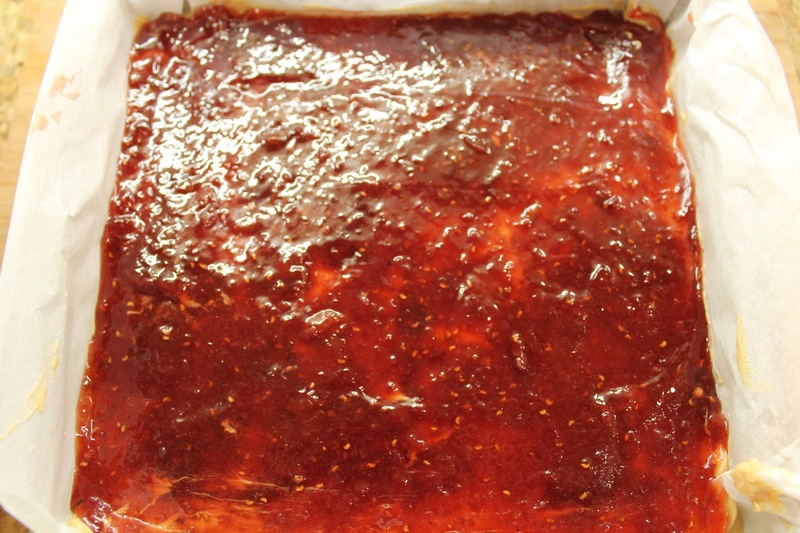 It will help the jelly from oozing out all over the place when it's cut. 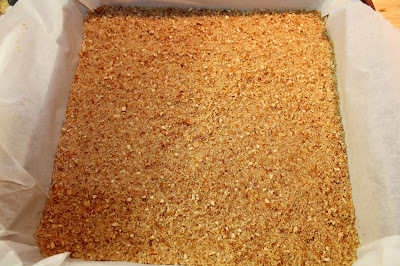 Once well chilled, cut into bars. I hope you had these bars available to you right after you went through that whole mess. Customer service issues make me SO mad. I love that you added pretzels to the PB & J combo - They look SO good! These are gorgeous looking bars! 1 - opening photo - most beautiful picture ever! 2 - will be making this! 4 - I'd come over and help but then you'd need someone to come over and fix what I screwed up! 1 - I totally love you for saying that! 4 - We would make a great pair then...Ha! Thanks so much for stopping by Ceecee! These look amazing! Love the pretzel crust too! My husband and son would LOVE these! :) Thank you for sharing at Marvelous Mondays this week. Good customer service is one of my biggest pet peeves. I find that negative feedback travels way faster and farther than positive sometimes. You think businesses would make it their first priority! 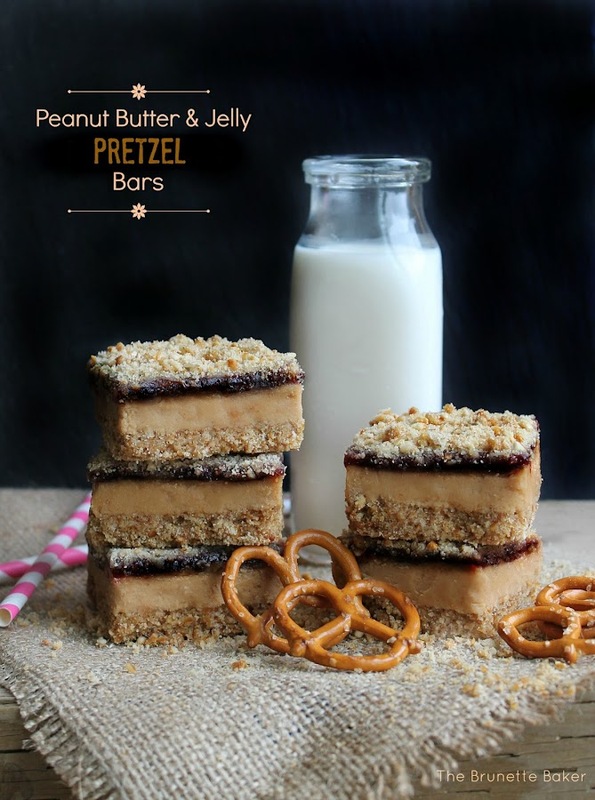 Had they given you exceptional customer service, you may just have been inclined to bring them some of these fabulous Peanut Butter and Jelly Pretzel bars to show your appreciation! Would you believe I came back to these bars in particular just because I remembered how good they look. They are perfection! I can't wait to get off this Whole30 mess and indule just a little, hahaha! I have to say I am feeling pretty darned good with no sugar intake, though I hate I can't have these for another 2-3 weeks! I NEED to make them soon! 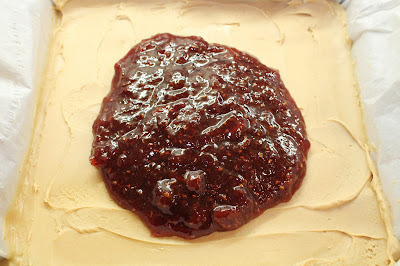 As far as I'm concerned, you can't go wrong with peanut butter & jelly anything! With these babies, you might even be able to bribe me into helping with the gazebo! Those bars look delicious! Three of my favorite things, peanut butter, jelly and pretzels! Costumer Service seems to have gone down the drain. I sometimes wonder if employees do not pay attention during their training or if their training could be better. Glad your got your gazebo and the problem fixed! These look delicious. Never had the combination of peanut butter and pretzels though. I found your blog post on Time to Sparkle Tuesdays. That stinks about the customer service! I am a retail store manager and let me tell you that would have never happened under my watch! Now these Peanut butter jelly pretzel bars? Oh My Word do these look amazing! You totally have been pinned!!!! That totally would have driven me nuts! Good think you were squeaky :) These bars look freakin' awesome by the way. Kinda perfect actually. Pinning and featuring tonight! These bars are gorgeous! 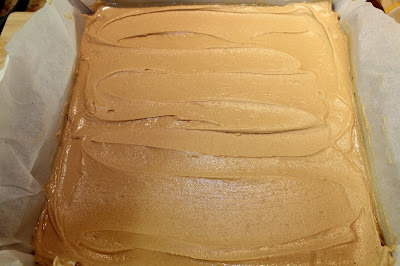 I just wrote a cookbook about PB and I have a PB&J bar recipe in there...and yours are stunning. I want to gobble them up! Found you from Karly's site! 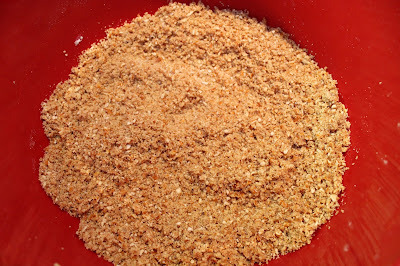 A little question - do you crush the pretzels in a food processor ? These look and sound so yummy! I can't wait to make them. Also, I'm pretty good at putting stuff together (even if I am a girl). I'd help with the gazebo if I was closer. I'm sorry about your crappy customer service experience (or lack there of, obviously)! I would have been quite upset as well. However, these look AWESOME! I need to make them...like now. Pinned! I made these and they are AMAZING ! !